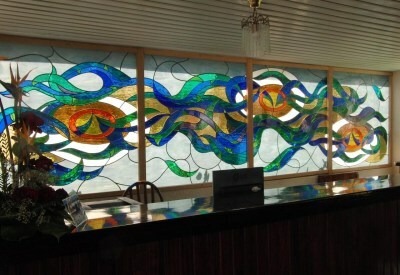 This window is installed in the reception area of the Punta Blanca Hotel in Varadero, Cuba. In this design I have tried to portray the blue hues of Varadero Beach, which change often during the day. In each piece representing water, I always incorporate a green element to suggest marine vegetation. The three suns represent three different times of day: sunrise, midday, sunset. To achieve realism, Spectrum Waterglass was used for the waves and Cathedral RR for the suns. Because there was little natural light, I used semiopal light blue for the background, which represents the sky, to enable the cathedral colors to stand out. It was important to exercise great care when creating each panel so that the edges would join and flow to form a perfect sequence. I love the sea, so it often appears in my work. One of my favorite designs is a set created for the Club Amigo Atlántico hotel on Guardalavaca Beach in Holguín, one of Cuba's most popular tourist destinations. I used Glass Eye 2000 to design all of these artworks, and found the software to be extremely useful. I would say that I am addicted to it. It is like a person's right hand: indispensable and irreplaceable. When I first started working on windows, I had to have five photocopies of a design, coloring each one to see the alternatives I could use. Later, in 1999, using my first computer, I began to do my designs with Office Paint and Corel Draw, but these still did not satisfy my needs. It was during this time, while surfing the Internet, that I found the Dragonfly Software website, and I soon began experimenting with Glass Eye 2000 using the 30-day demo. Upon hearing how enthusiastic I was about the program, a good friend from Holland purchased for me the Standard Edition. It's a fantastic program, a perfect and excellent tool for the creation of stained glass panels and lamps. It has everything a person needs; really nothing is missing but the creativity of the artist. For example, I remember many headaches trying to figure out how much glass and lead came was needed for a specific work, and now that headache is a thing of the past. I'll surely be upgrading to the Enterprise Edition soon. Thank you, Dragonfly Software, for your products and your professional support. 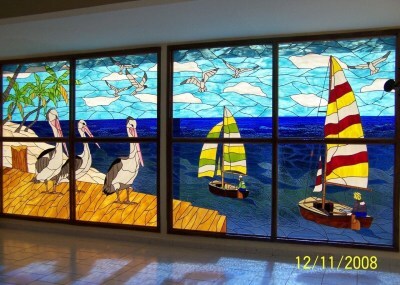 During the 1990's, while working at an imports company, Francisco Javier's duty was to buy glass and tools for stained glass artists. It was then that he discovered the beauty of glass. 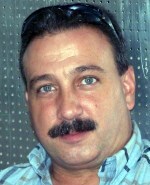 Soon after he began to investigate and study lead and Tiffany techniques, and in 1996 he presented his first works at a public exhibition. In 1998 he opened his own artistic studio named SAUSAND, in honor of his two children, Saul and Sandra. 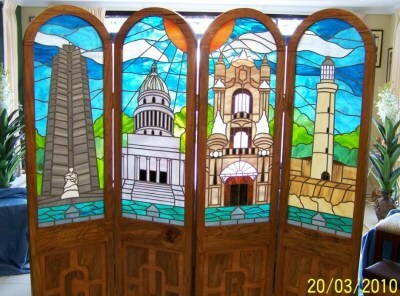 In 1999 he became a member of the Cuban Association of Craftsmen, and today he is vice president of the stained glass division. To date he has completed more than 60 works, which are displayed at hotels, restaurants and other institutions. You may reach Francisco Javier by email.